"The Australian Open has obtained permission to follow Wimbledon in shortening the potential length of matches by introducing a tie-break in the deciding set across all events. However, in a move that perfectly sums up the lack of uniformity across the four grand slam tournaments, Australian chiefs have decided their preference is to play a “super tie-break” at 6-6, in which the player must win ten points by a margin of two. With approval recently granted by the grand slam board, players are now being consulted to determine whether this should be introduced as soon as the 2019 tournament, which begins on January 14. It is possible that the full implementation could be delayed for another year, with only a trial taking place next month…"
We are going to have a different rule for each of the four Grand Slams. First they get rid of Kia guy. And now they’re bringing in Super tiebreaks? Craig what are you doing?! And it's all because of Isner. Are they going to bring back old rules after he retires? Waiting for that Kermit guy to say he always preferred having a tiebreak in the fifth set, now that Roland Garros is the only Slam without it. But super TB at 6 all. I hope the French stick to their guns on this. It's so nice when you don't care either way. For once in a thousand years, the FO seems not to do something stupid. Rolland Garros will remain as the true slam and the slam for fighters. Rollan Garros will remain as the true slam and the slam for fighters. It's better than going to a regular tiebreak I suppose. A little more wiggle room but still. Can someone explain what this means, I actually don't know. Words can barely fathom at how many levels this decision is not just wrong, but atrocious. And I would rather see Alexander Zverev win a Grand Slam than see Isner have the faintest joy in his life. The 5th set will have a tiebreak if the two players win six games each. But unlike the classic tiebreak where you need to win 7 points (with at least a 2 point difference), in a super tiebreak you need to win 10 points. And I thought the new TTW layout was a bad decision. Why does everyone feel the urge to fix what’s not broken? Think of how incredibly stupid the average human being is. Consider the fact that half the people on earth are dumber than that. Sorry but why is this considered bad? So at the FO the 5th set winner has to win by two games like 9-7, no tie breaks? Super tiebreaker makes little sense. A regular game is 4 points. 10 points is the equivalent of 2.5 games. 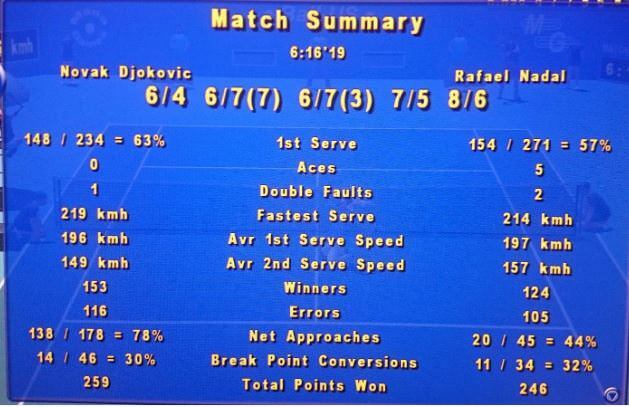 Maybe in those 2.5 games there would have been a traditional break of serve. Super TB only makes sense as replacement for 3rd set. Yes, at the French Open the player will have to break the opponent's serve in the 5th set in order to win. Personally I am fine with either kind of 5th set as long as it's good quality. Drama is guaranteed whether it's a tiebreak or a longer marathon. I'm reviewing the Isner/Anderson match at Wimbledon this year and when they reached 12-12 in fifth set, they didn't do a 7 point tie break like you said. Rule was changed after (and because of) that match. That's because the new rule was introduced after this year's Wimbledon. It will be applied from 2019 onwards. Ah OK sorry my bad guys. Thanks, sometimes hard to keep up with these changes. I looked at all the AO finals back 10 years and I don't think any fifth set went the distance so I guess its whatever with the change. So someone wins when they get to 10 regardless if its 9-10, the 10 still wins? I prefer myself to have a winner win by two, whatever it is either a point or sets. What happens in Topspin 4 should stay in Topspin 4. We'll never know how this particular Tennis Elbow epic from a couple of years back would have ended in a super tiebreak. But honestly, I don't care. 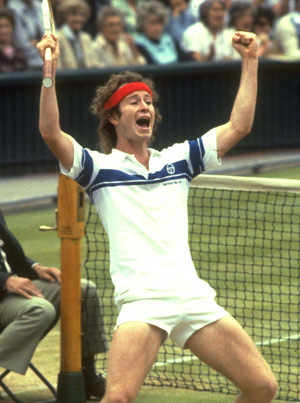 Tennis is the greatest individual sport. No, I think it's still win by 2 points. 10-8, 12-10, etc. So we'll never see super tie break being used? Could be in early rounds. Roland Garros is the only true slam now. Play a Super-tiebreak instead of a fifth set. And use the Coman tie-break. Give every spectator a vuvuzela pls. Mission... not accomplished. We must get rid of dis BO5 thingy altogether. Hopefully RG will to switch to 'fast 4', best of 3. But allow Nadal 2 minutes between points to make up for the time savings. Sometimes I think I am a decent human chap. Then I see that picture and I feel a deep rooted desire to do evil. Likes: Nadal_Django and vive le beau jeu ! Mac has always been advocating just a regular TB in the fifth set of slams, not this "super TB" nonsense. Moving forward players will be judged on how many "True Slams" they won. Why are super tiebreaks more nonsensical than regular tiebreaks? Yes.No tie breaks at all at the FO in a couple of years.